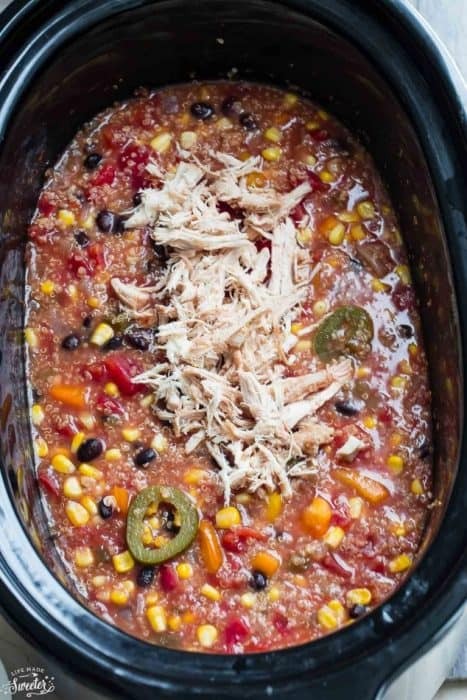 Slow cooker Chicken Enchilada Quinoa Soup makes the perfect comforting meal to warm up with on a cold day. 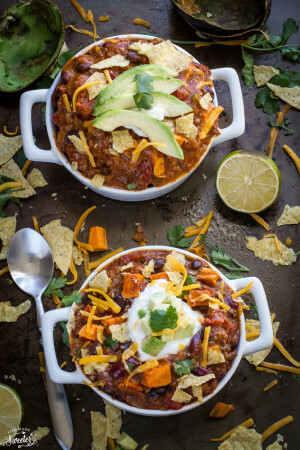 Full of zesty Mexican flavors and an easy “dump it and forget about” it kind of meal. My husband has a big obsession with enchiladas and even though I make it for him quite often, I’ve been trying to find other ways that he can get his fix without all the extra hassle and mess of rolling tortillas. 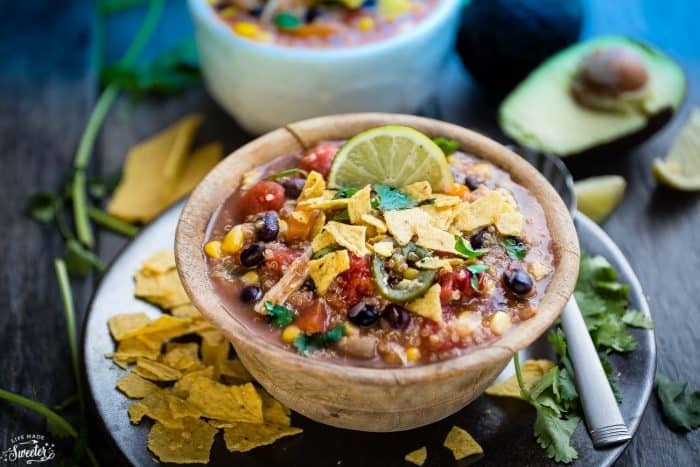 Since he enjoyed this one pot enchilada pasta so much last time, I was hoping he would be on board with this Chicken Enchilada Quinoa Soup which I thought was even better than the pasta. Thankfully, the hubs thought so too and said it was not one of his favorite soups ever which makes me super happy because it is seriously SO easy to put together. Easy dump and forget it slow cooker meals like this have been a lifesaver lately while I’m on the last stages of finishing my manuscript. So when KitchenAid found out I was writing a slow cooker cookbook back in December, they kindly sent me this 6 Quart Slow Cooker and this 4 Quart Multicooker to help with recipe testing for my cookbook. They work like a dream and have been extremely helpful with the extra meals I’ve been making. The 24-hour programmability makes it so convenient since I can gather all my ingredients and set this to cook at a specific time for when we are ready to eat. The digital display is easy to read and the automatic keep warm mode is perfect so our food will stay warm even after the food cooks. I love how evenly they both cook and the 6 quart one is the perfect size for making big batches of soups like this one. I just tossed in the chicken, black beans, corn, jalapeno, enchilada sauce, diced tomatoes and onions together. Then after a few hours, all the wonderful zesty flavors melded together into a hearty and delicious soup. 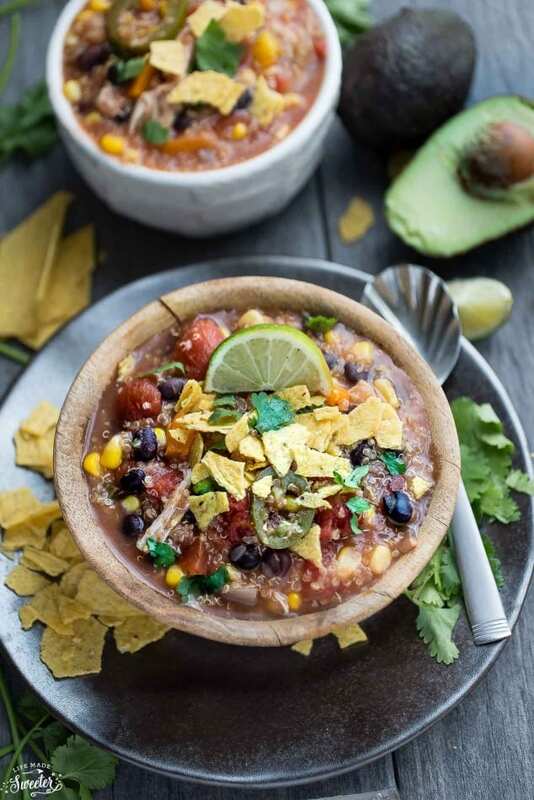 You can use your favorite homemade or canned enchilada sauce and it’s also easy to customize with your favorite veggies and toppings. 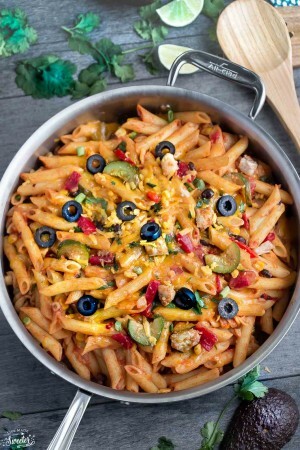 So tasty, simple and perfect for those busy weeknights. 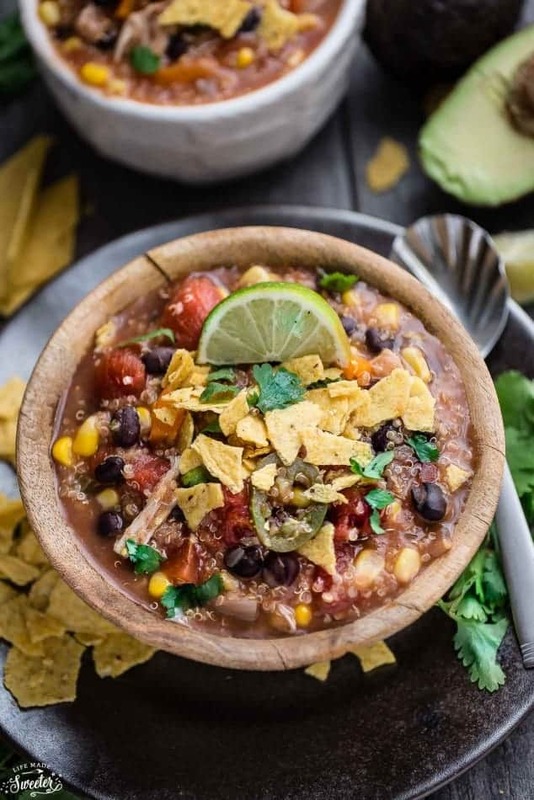 Slow cooker Chicken Enchilada Quinoa Soup makes the perfect comforting meal to warm up with on a cold day. Full of zesty Mexican flavors and an easy "dump it and forget about" it kind of meal. Sliced avocado, shredded Colby Jack cheese, sour cream, lime wedges and tortilla chips. 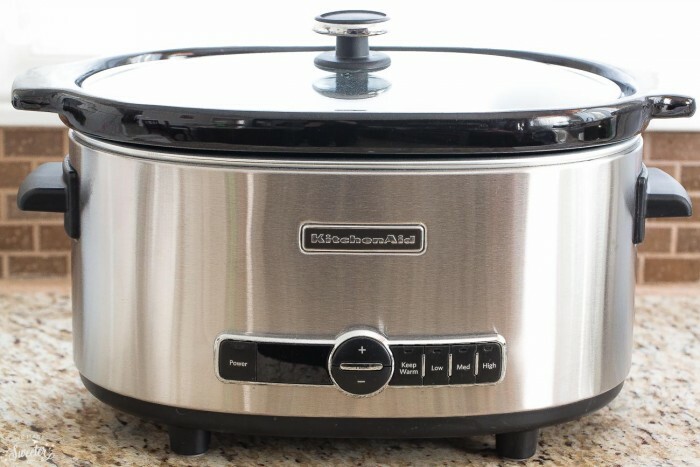 Lightly coat slow cooker with nonstick spray. 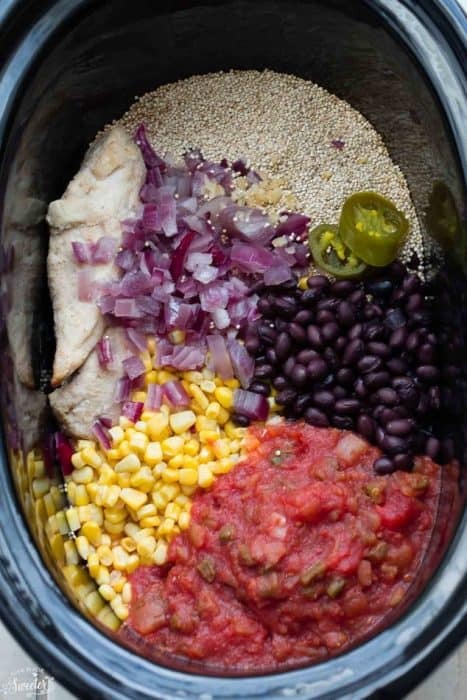 Place chicken, quinoa, corn, black beans, garlic, onions, jalapeno and cumin in the bottom of slow cooker. Add diced tomatoes, enchilada sauce and pour in chicken broth. Stir until combined and cover with lid. over Cook on high for 2-3 hours or low for 5-6 hours. Remove chicken and shred with two forks. Return chicken back into slow cooker and stir to combine. Serve in bowls with fresh cilantro and toppings of your choice. *If you have an older model slow cooker, you may need to cook this for an extra hour longer since the heating element may run at a different level. *This soup is on the thicker side so feel free to add more chicken broth or water for a thinner consistency. Disclosure: This post is created in partnership with KitchenAid. All opinions are 100% my own.